As we have been discussing through the past few posts that we can direct event log data generated through EventSource to be saved in different destinations. EntLib6 provides a number of sinks provided just for that purpose out of the box. They include support for console, files, Sql Server database and Windows Azure Table storage. 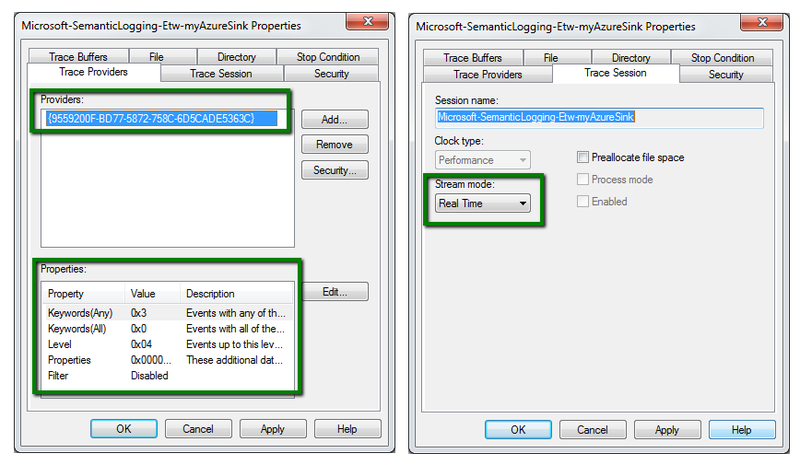 We have also seen how we can direct the event's data to Windows Event Log [Discussion]. It would be interesting to see how we can use the existing ETW tools to view the event's data generated using EventSource API in .net framework 4.5. EventSource API is based on registration free ETW [Event Tracing for Windows] data. This means we don't have to register an ETW event provider for generation and consumption of these events. 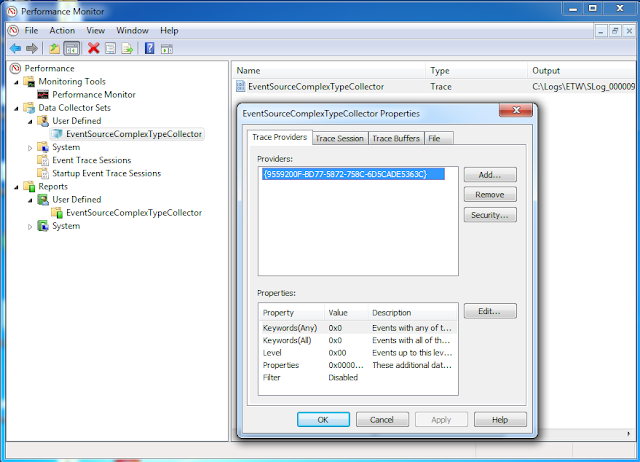 The existing tools including LogMan and Windows Performance Analyzer are based on registered event providers. 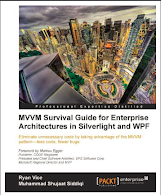 But since EventSource API is still based on the same ETW infrastructure, we can register the Event Provider manually and direct the events' data to an ETL file. Since these tools can work with this format, we can use our expertise in these tools to troubleshoot and analyzer situations we need this data for. It must be remembered that EventSource API uses ETW infrastructure only in the case of out-proc listeners. Since EventSource establishes an ETW session for out-proc consumers, we should be able to use PerfMon to see the details of the session. As an ETW provider, each event source is assigned with a GUID. We can note the unique identifier from the properties of the provider. This identifier is generally used by ETW controllers to start / stop a session. We can also verify that the streaming mode for the configured EventSource as Real time. Like PerfView, PerfMonitor is also based on TraceEvent library. The major benefit of PerfMonitor over Perfmon is that the former can be used as an ETW controller. Internally Logman seems to use Performance Logs & Alerts service. If the service is not running, the utility just starts this. Make sure that we are running the command prompt with Administrative privileges. Here we are creating a trace data collector using Logman utility. After running the above command, we should be able to find the specified collector when queried. This can also be done using Logman. The utility supports a verb "query" which list all the data collectors. Querying the provider again should show the status of the provider as Running. This should ensure that the command ran successfully. Stopping the trace session should flush the trace data in the ETL file. Here is the file generated for our provider in the same folder as we specified while creating trace data collection for the provider. Logman also registers a user-defined trace which can be viewed with Performance Monitor. The above command should generate dumpfile.xml and summary.txt in the same folder. For the events generated for our event provider, the following files are generated. You can open them to have an idea about the expected format for the generated files. We should note that the utility allows us to control the names and format of dump and summary file names and formats. The supported formats for dump file include XML (default), CSV and EVTX. We can also generate xml (default) or html based report for the generated events data. Here we are generating the report in html format. It generates the report based on the etl file provided in the same command. You can have a look at the following report generated for events generated from our event source. Tracerpt can also use ETW data from real time sessions. We can use PerfMon to determine the session we are interested in. We can then use the same name with -rt switch for TraceRpt. Here is the session details for our event source.